Like lots of you the good weather has been glorious here and after an exam yesterday, with sun pouring through the window in front of my desk, the boys and I decided enough was enough. Time for coffee. The Boys indulging in coffee and apple pie, tea and caramel shortbread. 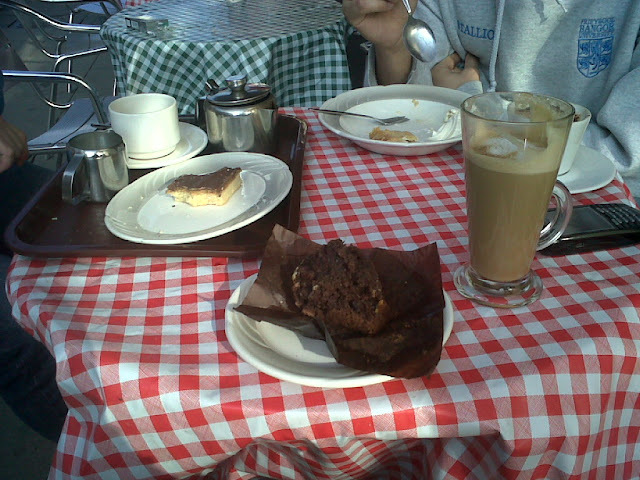 My coffee and the nicest chocolate muffin I've ever had. We spent 3 hours sat outside, enjoy the afternoon sun and talking about nothing in particular. Blissful. And I'm certainly glad we decided to make the most of the sun yesterday afternoon, because today I woke up to grey skies, drizzle and a slightly cooler breeze. Spring sprang, but hopefully that's not the end of the lovely weather. Sitting outside with the boys brought back memories of being abroad. Living in France, Germany and Spain, sitting outside cafes with a soft drink or a coffee was a frequent occurrence but was something I had rarely done here. The cost of cafe culture in the UK can be almost double that in Germany or Spain and as 18 years old freshers we were more interested in partying hard than chilling out. But along with improvements to university buildings since we've returned from our time abroad, have come improvements to the campus cafe and an additional coffee bar for students. This means coffee is not only readily available, but reasonably priced and convenient. Cue a rising trend in cafe culture for us, and even further enjoyment in finding independent cafes like the one we went to yesterday that offered a good value and and a change to the routine. I'm interested to know, what are your thoughts on cafe culture? Love it? Hate it? Do you consider the larger chain coffee shops to be a great social meeting point or an overpriced fad? I love cafes...big chain or local independent, I don't care! Oh that looks gooooood! I do prefer little cafes on the whole, but I tend to end up having lunch rather than just a quick coffee most of the time and so it's often a lot easier to go to the chains because they label their food and I know it won't trigger any food allergies. I've loved the recent hot weather, however, for the past two days it's been raining which isn't so nice!